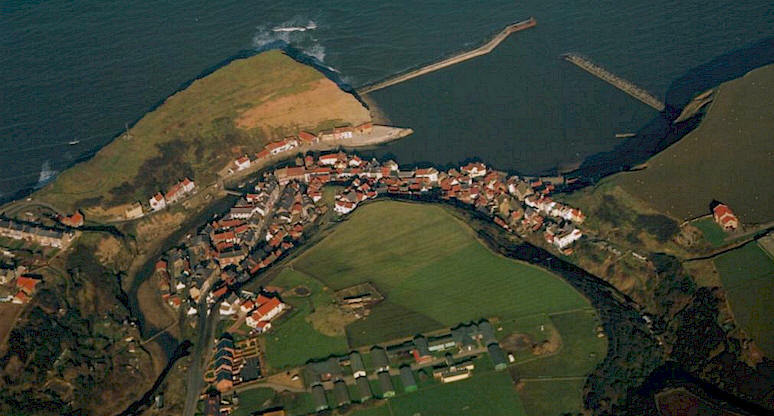 Ariel view of Staithes, North Yorkshire. Staithes, in the parish of Hinderwell and the North Yorkshire district of Scarborough, was once one of the largest fishing ports on the north east coast of the United Kingdom and an important source of the minerals Jet, Iron, Alum and Potash. Staithes today is a very attractive tourist destination of great interest to both the amateur and professional Geologist. This section of the UK is known as the "Dinosaur Coast" being predominantly of the Middle and Lower Lias Period but much more of that later!